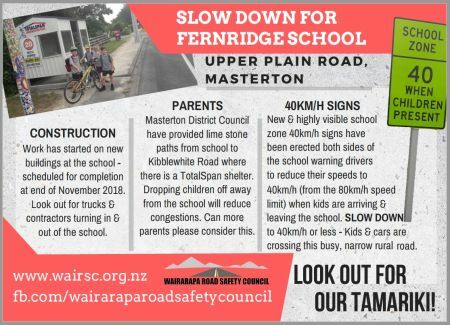 Advisory speed warning signs around Fernridge School in Masterton have been erected to slow traffic outside the schools gate. This follows requests to the Wairarapa Road Safety Council for help in reducing the congestion around the school gate during peak drop off and pick up times. Previously in 2014 Fernridge School celebrated a Shelter and Pou being built for use of School students to meet a short walk away from the school on the corner of Upper Plain Road and Kibblewhite Road, promoting safe and active travel to boost the number of children walking and cycling to school. Walking School buses have been in operation so students can walk together with a teacher/adult providing a “safety in numbers” approach. Projects Coordinator for Wairarapa Road Safety Council Holly Hullena says “When focusing on speed issues around school areas there is no one single thing that can ‘fix’ a situation and there is no quick-fix in any case”. “Consultation and Surveying are key elements, but a major part of fixing any congestion issue outside the school relies heavily on public behaviour. Those who drive past schools to work or who are dropping off or picking up students are required to be considerate and mindful of children – especially during peak school times”. “We can use this opportunity to encourage students to walk the last 300 or so meters to school. Setting a pick up and drop off point for you kids encourages independence an health-conscious behaviors such as warming up their brains before they reach the classroom. Carpooling to reduce the number of vehicles outside the school gate is another way of reducing the amount of cars parked outside the school”. With the help of Masterton District Council, new School Speed Advisory Signs went up at the start of the year ready for the beginning of Term 1. Fernridge School is set on Upper Plain Road, which is on an 80km per hour stretch of road linking town and country. After surveying the roads in varied weather conditions during peak school drop off and pick up times, the decision was made to put the signs up in conjunction with the school expanding their buildings to cater for the increase of students on the school role. Holly Hullena said crashes involving school aged pedestrians and cyclists can be avoided. “Nobody wants to see kind of headlines. Using a proven combination of reduced speed, community engagement and schools having travel plans in place will ultimately combat this”.